Sleeping in one's corsets is another not uncommon fantasy that is entertained by some correspondents. But it does happen in reality. I have known several women who have slept in their corsets. Invariably they have serious back problems, and however hard the bed, a firm corset for the night-time can give tremendous relief. The lady pictured on the right is featured in Spencer's "Advice to Doctors: 1953". The poor lady in question had a bad back following pregnancy and was quite incapacitated until fitted with these corsets. She wore them night and day for five months and were described as "quite comfortable to sleep in". Sleeping in a brassiere is far more common and provides a great comfort for women with naturally large breasts or breasts enlarged during pregnancy. A well-known BBC presenter famously spoke of sleeping in her brassiere. It was the only way that her D-cup breasts felt comfortable. Eventually, and against her husband's protestations, she had her breasts surgically reduced and slept without a brassiere thereafter. 'a night support slightly boned'. A feature that recurs throughout the pre-War era is the moralistic exhortation to perform one's 'duties' whatever. So often, in the Spirella literature, references are made to a woman's corset allowing her to perform her duties. This theme was carried strongly through the war years, when, in fact, the corset would be essential to a woman attempting a heavy manual job without any previous experience. How amazing, that a lady as practical as a farmer's wife would need help to fasten her boots. We have little comprehension these days of the attitudes, beliefs, morals and sense of duty of the time when this letter was written 88 years ago. I must work, it is my duty. I need to wear boots, but I can't lace them if I wear my corsets. Therefore somebody must fasten them for me. Altogether, it's another world! 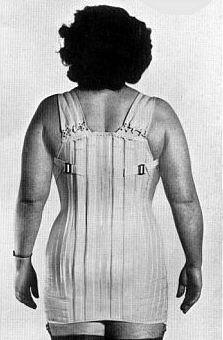 From Spencer US in 1947, a brassiere designed to be worn in bed.